Linkin Park will honor their late bandmate, Chester Bennington, with a tribute concert at the Hollywood Bowl on October 27. Performing together for the first time since Bennington’s July 20 suicide at the age of 41, the group’s surviving members will be joined by a number of other artists while raising money for Music For Relief's One More Light Fund in his memory. A Linkin Park Underground pre-sale starts Tuesday, September 19 at 12 pm Los Angeles time, with public tickets available Friday, September 22 at 10 am Los Angeles time via Ticketmaster. 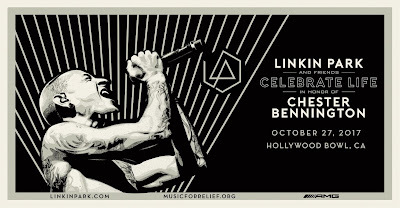 In sync with the tribute concert news, the band also issued a video for the title track to their current album, “One More Light”, directed by Joe Hahn and Mark Fiore. “It has been incredibly emotional to work on this, and especially to watch it,” says Hahn of the clip, which features images of Bennington on and off stage. “I feel that by doing it, we not only faced some of our biggest fears, but it enabled us to use our talents to bring some light to people that need it.